Nifty Futures continued its Fridays sentiment, opened gap up above the previous week high levels with a greater confidence on Mondays Trading Session. Confidence of the buyers maintained throughout the day. 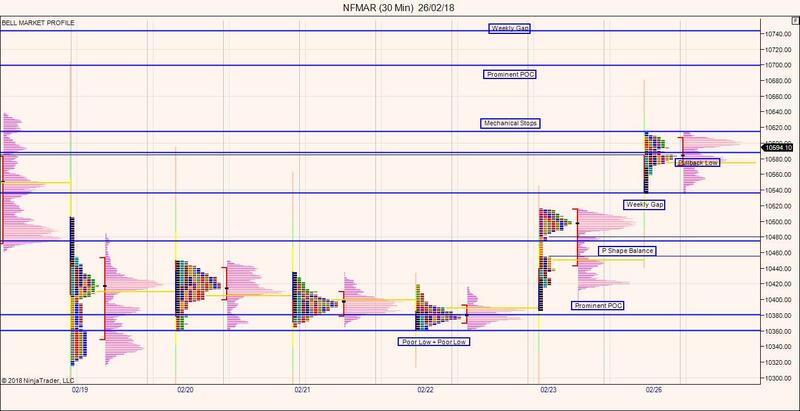 On the Daily timeframe Nifty Futures looked below the balance and now back into the balance and filled the balance completely. We also talked about the Strong ORR levels at 10343 where responsive buyers came whenever the price plunge below the strong ORR levels during February expiry. such multiple attempts at any strong support levels will weakens those levels. Now its time to approach the current trend in a cautious manner and now more and more people would be chasing the price alone rather than giving importance to such weakened reference levels. Short term supports are at 10588 levels. Nifty is likely to take out the Mechanical stop levels 10614 at Tuesdays trading open session.Price has to close below 10588 levels for any meaning full change in the current uptrend (i.e positive mode to negative mode). Next reference levels to watch Prominent POC at 10700 and Weekly Gap 10724 levels. However ORR levels at 10343 is a concern for this series as price have higher probability in testing towards those reference again in short term.